Dragon Time Essential Oil is a wonderful blend of oils that is relaxing. Its balancing properties make it a perfect choice for supporting normal, healthy emotions during the female monthly cycle. Dragon Time is recommended for young and mature women. Finding the right oil for your special needs depend on so many factors; so you may have to experiment with several oil blends. Other oils that have similar qualities include Mister and EndoFlex. Personally, I go back and forth between EndoFlex and Mister. And sometimes I need to combine them! This wonderful oil is also available in a massage oil and bath and shower gel for those of us who want convenience. Or make your own by adding it to a fragrance free body oil or bath gel! Some men have also responded well to Dragon Time essential oil using it alone or with Mister Essential Oil. This is a fun and easy reference guide for Dragon Time Essential Oil Blend. It will tell you how to use your oil blend and what to use it for. It will also provide you with some fun tips and testimonials! Want to Purchase Therapeutic Dragon Time Essential Oil? Go to the Oil Shop! Buy Dragon Time Oil Here! What is in Dragon Time Essential Oil Blend? There are six different therapeutic grade essential oils in Dragon Time Essential Oil. They are listed below along with a brief description of each oil. Jasmine Absolute (Jasminum officinale) as a wonderful aroma that eases stress and uplifts the mind and body! It is also beneficial for supporting healthy skin. It has been used throughout history for romance and attraction and for balancing the feminine energy of the body. Clary Sage Essential Oil (Salvia sclarea) has been used for centuries to help support the female body and it's own challenges. It contains sclareol which is very rare when distilling essential oils. Supports normal, healthy attitude; and menopausal women*. Lavender Essential Oil (Lavandula angustifolia) can help you relax, wind down before bed and even ease stress. Its balancing properties can create a relaxing atmosphere. Fennel Essential Oil (Pelargonium graveolens) The Benefits of Fennel date back to the ancient Egyptians. It is stimulating to the circulatory, glandular, respiratory, and digestive systems*. It also may support feelings of well-being during the menstrual cycle. 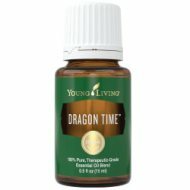 What are the Documented Uses for Dragon Time Essential Oil? Deodorant, supporting normal, healthy emotions during the female monthly cycle. young and mature women. What is the Spiritual Influence? Dragon Time promotes the emotions of forgiveness, gratitude and self worth. It helps us release emotions of anger and self-esteem issues. This oil will help you to love and forgive yourself; and let go of the past so you can move forward. Can this Oil be used for Animals? Yes. I use it for emotional balance, normally mares do well with this oil. What are the Safety Precautions? Possible skin sensitivity. If pregnant or under a doctor's care, consult your physician. Dilution not required; suitable for all but the most sensitive skin. Generally safe for children over 2 years of age. Apply on abdomen or lower back and place on hot compress. This feels great!